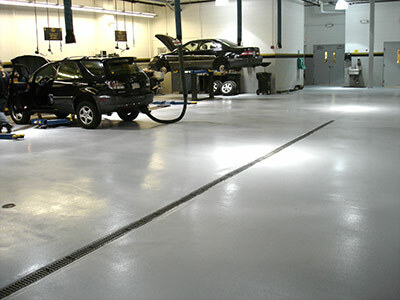 Automotive Flooring – whether a large dealership or small vehicle repair facility, ProREZ offers a broad spectrum of highly functional and decorative polymer flooring systems for all types of service, repair, paint, body, and wash bay areas, as well as parts, office, and showroom areas. In the service bay areas, these seamless, non-porous flooring systems are engineered to take the punishment- the harsh chemicals, oils, grease, fuels, point-impact from parts & tools, heavy vehicle & foot traffic, etc. Our systems are hardworking & hardwearing, with long-term abrasion, scratch, chemical & stain resistance. Various non-skid textures, line striping and safety markings can help establish work & traffic zones, as well as enhance overall work efficiency and company image. On the front-end, ProREZ Coatings can provide high-performance flooring solutions that are stylistically designed using a wide array of standard or custom colors, blends, patterns, and textures. We can customize to suit any décor or theme. Whether installed in a service bay or showroom, all of our highly durable systems balance safety, with overall ease of cleaning & maintenance. Vehicle maintenance bays in service garages endure much punishment, with protective flooring systems exposed to heavy load capacities from cars, trucks, and equipment, point impact from dropping tools & parts, harsh cleaning materials and other chemicals, among other abuses. Seamless, non-porous polymer flooring systems installed in these areas must be heavy duty, with industrial strength & resilience to endure the rigors of their challenging exposures- physically and chemically. Ease of cleaning & maintenance are imperative, but must be balanced with a finish that’s hardwearing & non-slip resistant. 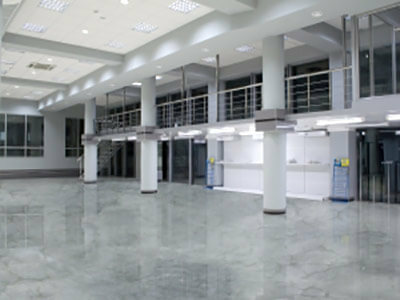 Safety, ergonomics, and company image are further enhanced with a flooring finish that’s bright & light reflective increasing illumination and visibility within the space. Projecting a clean, bright, well-maintained, and pleasant atmosphere says a lot about the business to staff & customers. Vehicle showrooms need to provide alluring design and aesthetics combined with a highly durable and hardwearing finish. The floor needs to be beautiful and pristine underfoot projecting a bright, stylish, and well-maintained appearance to staff and prospective buyers. These seamless, non-porous flooring systems need to be easily cleaned and maintained while balancing safety with customizable non-slip resistance. At ProREZ, we offer a broad spectrum of high-performance, decorative, and budget-minded options in standard and custom colors, blends, patterns, and textures complementary to any showroom décor or theme. Unlike other conventional flooring products, a hardworking resinous flooring system does not require the long-term life cycle costs associated with waxing, buffing, and chemical stripping. These reduced life cycle costs can bring added value to the flooring investment.